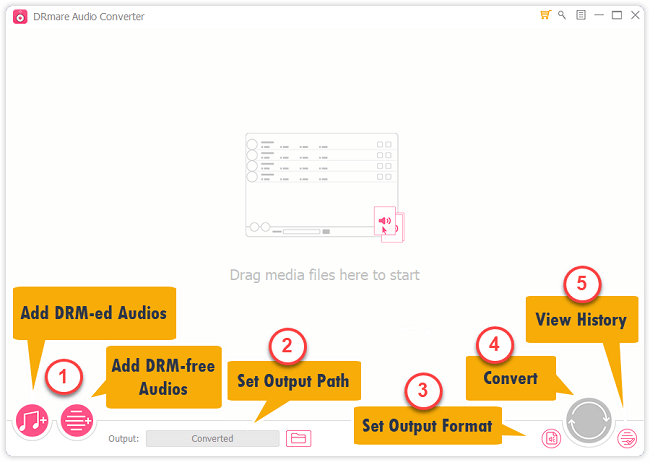 DRmare Audio Converter for Windows is a DRM removal software. 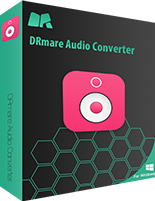 DRmare Audio Converter 2.0 for Windows was available as a giveaway on January 20, 2019! How would you improve DRmare Audio Converter 2.0 for Windows ? It is the most advanced iTunes M4V video converter. If you have purchased movies/TV shows from iTunes store, you may know all iTunes videos are DRM protected, it can be played on Apple devices only. 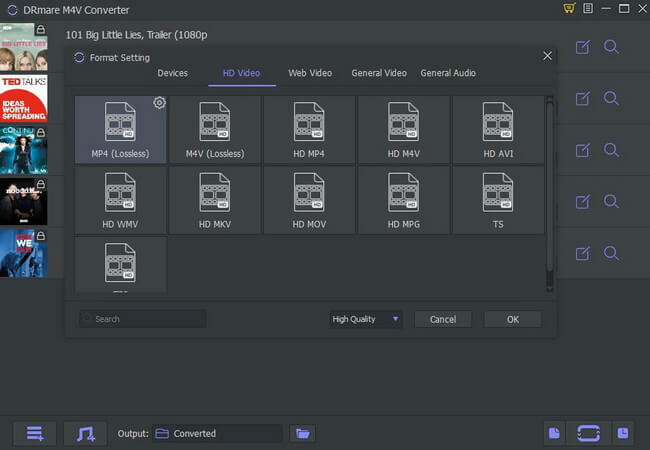 Now this tool can help you remove DRM protection and convert M4V to MP4, MPG, MOV, FLV, AVI, MP3, M4V, etc with all audio tracks, subtitles at 30x faster speed with lossless quality. 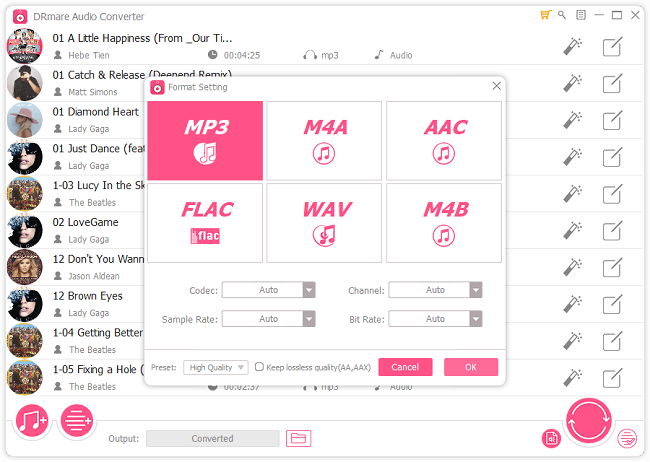 DRmare Spotify Music Converter is an easy-to-use Spotify Music Converter. 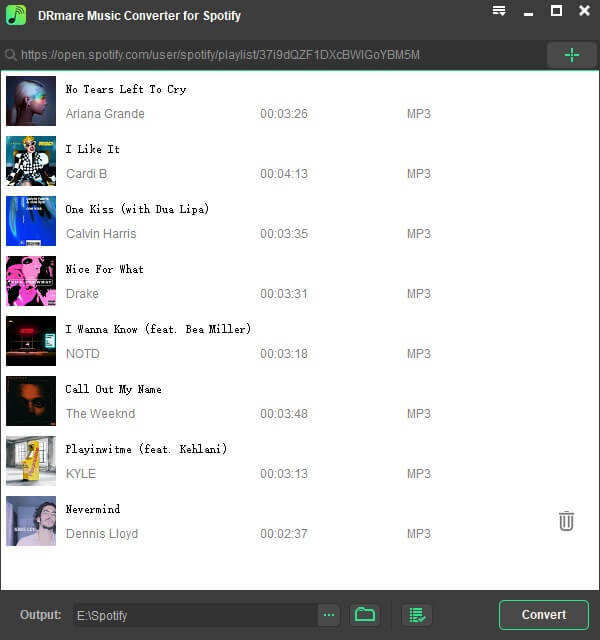 It can help you remove DRM protection and convert music to MP3, AAC, WAV, FLAC, M4A, M4B losslessly, offering you are great experience to enjoy Spotify music offline on any player and devices with free account, no need to upgrade to premium. It made duplicate directories in the output folder -- how did it do that? Duplicate names are supposedly impossible in Windows.
. It made duplicate directories in the output folder -- how did it do that? Duplicate names are supposedly impossible in Windows. What a mess. .
Thay add a SPACE to the end of the duplicate directory, making control of the directory outside the operating system's normal capabilities. I have to go through the entire output directory and rename the errant folders to put a character at the end, such as changing "name " to "name 2", otherwise, the operating system can't handle the directories, such as the operating system can't find or delete the directory if it has a space as the last character..
. Thay add a SPACE to the end of the duplicate directory, making control of the directory outside the operating system's normal capabilities. I have to go through the entire output directory and rename the errant folders to put a character at the end, such as changing "name " to "name 2", otherwise, the operating system can't handle the directories, such as the operating system can't find or delete the directory if it has a space as the last character.. What an unholy mess. . It would be nice if it would save the converted files in the same location as the originals instead of creating a whole new separate output structure, which would save the need for a great deal of subsequent re-structuring for my directories or trying to find another program that might automatically put the converted files back where they belong. It would be nice if the tweak to change speed would be configurable for a user-selected beats-per-minute target, and a promise that it will not change pitch would be nice, though a separate pitch control with a user-selected target pitch and or key would also be nice ( did anybody else find the pitch control ? ). The reason it depends on Apple iTunes is at least to remove DRM from Apple media, including audiobooks, which it offers to arbitrarily divide into smaller files as unintelligently divided sub-chapters ( some original audiobooks are one file for hours of reading, hardly manageable ). There's no progress indicator, so be patient and separately use Windows File Explorer to open the output directory and open a *. * search to watch as files add up -s-l-o-w-l-y-. The interface is unnecessarily obtuse and non standard with critical information hidden in unrelated preferences or perhaps other places, I've not found everything that controls what it can do and what happens and where it happens. -- Non-DRM Audio Formats	M4A, M4P, M4B, MP2, WMA, WAV, OGG, FLAC, AAC, AC3, M4R, RAM, MKA, etc. Okay, let's discuss converting to FLAC ... from lossless full 100% original quality WAV perhaps? If you're not sure it added files, and add them again, it does not know you added duplicates, and adds them all again, and again, and again, argh. Too bad it's such an unholy mess, because it appears to have some savvy programming somewhere deep inside. I look forward to a subsequent version with the interface completely rewritten to reveal the probably good programming underneath. But the interface now deserves absolutely no respect, it's not even a good rough draft to present to an interface designer because it is so severely confusing, non-communicative, non-standard, and hides whatever the program can do and how to control it. Please come back with the next version after incorporating our insights.
. It would be nice if it would save the converted files in the same location as the originals instead of creating a whole new separate output structure, which would save the need for a great deal of subsequent re-structuring for my directories or trying to find another program that might automatically put the converted files back where they belong. It would be nice if the tweak to change speed would be configurable for a user-selected beats-per-minute target, and a promise that it will not change pitch would be nice, though a separate pitch control with a user-selected target pitch and or key would also be nice ( did anybody else find the pitch control ? ). The reason it depends on Apple iTunes is at least to remove DRM from Apple media, including audiobooks, which it offers to arbitrarily divide into smaller files as unintelligently divided sub-chapters ( some original audiobooks are one file for hours of reading, hardly manageable ). There's no progress indicator, so be patient and separately use Windows File Explorer to open the output directory and open a *. * search to watch as files add up -s-l-o-w-l-y-. The interface is unnecessarily obtuse and non standard with critical information hidden in unrelated preferences or perhaps other places, I've not found everything that controls what it can do and what happens and where it happens. Their web says: Supported Input Formats -- DRM Audio Formats	Apple Music, iTunes M4P, iTunes M4A, M4B, Audible AA, AAX -- Non-DRM Audio Formats	M4A, M4P, M4B, MP2, WMA, WAV, OGG, FLAC, AAC, AC3, M4R, RAM, MKA, etc. "... etc ...", really! 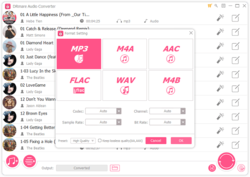 Supported Output Formats -- Audio Formats	MP3, AAC, M4A, FLAC, M4B, WAV Okay, let's discuss converting to FLAC ... from lossless full 100% original quality WAV perhaps? If you're not sure it added files, and add them again, it does not know you added duplicates, and adds them all again, and again, and again, argh. So far, half the time I load the program and load files to convert, it tanks out with a memory error ( Windows 7 64 ) Too bad it's such an unholy mess, because it appears to have some savvy programming somewhere deep inside. I look forward to a subsequent version with the interface completely rewritten to reveal the probably good programming underneath. But the interface now deserves absolutely no respect, it's not even a good rough draft to present to an interface designer because it is so severely confusing, non-communicative, non-standard, and hides whatever the program can do and how to control it. Please come back with the next version after incorporating our insights. Thanks. . I don't have Itunes, will this program do me any good? Also I have installed it and have tried to figure out how to register it and am not having success can anyone help me on that? kittenz07, Re "I don't have Itunes, will this program do me any good?" The giveaway needs iTunes. That is free software, provided by Apple. Youd can install iTunes for a test and uninstall it later if you do not want it anymore. Re: "have tried to figure out how to register it and am not having success can anyone help me on that?" Check the daily postings of Ootje on nl.giveawayoftheday.com. it is in Dutch, but he provides lots of screenshots with arrows etc. You can use Google Translate if needed. Todays registration is simple: I remember I saw the icon of a key on the top row, pershaps the third from the right. Click on it, and a registration windows opens, use any mail address you like (it does not need to be a working address) and the key that you see in the Readme. Use copy/paste (Ctrl-C/Ctrl-V) for that. kittenz07, Re "I don't have Itunes, will this program do me any good?" The giveaway needs iTunes. That is free software, provided by Apple. Youd can install iTunes for a test and uninstall it later if you do not want it anymore. Re: "have tried to figure out how to register it and am not having success can anyone help me on that?" Check the daily postings of Ootje on nl.giveawayoftheday.com. it is in Dutch, but he provides lots of screenshots with arrows etc. You can use Google Translate if needed. Todays registration is simple: I remember I saw the icon of a key on the top row, pershaps the third from the right. Click on it, and a registration windows opens, use any mail address you like (it does not need to be a working address) and the key that you see in the Readme. Use copy/paste (Ctrl-C/Ctrl-V) for that. 1.) This is one of those companies/softwares that try to make you use facebook to download the product. I hate Facebook, I never use it, and it annoys me when any company tries (unnecessarily) to make me use it or open a facebook account to access their product. Generally, I will just quit right there. 2.) Trying to download the SW also takes you into the iTunes store and engages you in the sometimes tedious process of updating your Apple account (need an iOS device!) and resetting your password. Did I mention that I also hate Apple for their greedy, elitist approach to devices and software? Some will think me negative "hater", but I don't consider myself that...with these two exceptions. Two of my biggest complaints: 1.) This is one of those companies/softwares that try to make you use facebook to download the product. I hate Facebook, I never use it, and it annoys me when any company tries (unnecessarily) to make me use it or open a facebook account to access their product. Generally, I will just quit right there. 2.) Trying to download the SW also takes you into the iTunes store and engages you in the sometimes tedious process of updating your Apple account (need an iOS device!) and resetting your password. Did I mention that I also hate Apple for their greedy, elitist approach to devices and software? Some will think me negative "hater", but I don't consider myself that...with these two exceptions. I really hope that you will offer the MAC version soon!!! Simply a superb software. I especially love the ability to split aax and m4b chapters into separate files... I really hope that you will offer the MAC version soon!!! drag and drop doesn't work? is there any tutorials? There are 5 instructions with a screenshot for each — one is a diagram that might help you if you haven't already gotten it figured out and working now. Liz, I found this link following HELP from the program menu https://www.drmare.com/drm-audio-converter-for-win/user-guide.html There are 5 instructions with a screenshot for each — one is a diagram that might help you if you haven't already gotten it figured out and working now. Lots of comments this morning, but none relating to how well this program works. Has anyone installed and used this software yet? If yes, is it worth installing? Lots of comments this morning, but none relating to how well this program works. Has anyone installed and used this software yet? If yes, is it worth installing? Thanks in advance! Install it yourself and then leave a reply on your experience rather than relying on other peoples feedback. Can this handle Sony MSV audio format? Trying 2 b Helpful, Even without any iTunes, the program can be of any meaning, just as a converter of music. Trying 2 b Helpful, does it still work if you block its network access? HellsBells, no windows 3.0 wasn't the first version. We had 2.0 somewhere in 1988 (or 89?) and 1.0 some 5 years earlier. I agree with Blackhad: the name should have been changed to Drmare Audio Converter 2.0 for Windows. But luckily we all can read. HellsBells, Re "Anyway, Microsoft went from DOS 6 to Windows 3....no 2.0.....l"
Nope: i still remember my boss being enthusiastic about Windows 1.0, later 2.0, then 3.0, then 3.1 ... i started using Windows with version 3.1. HellsBells, Re "Anyway, Microsoft went from DOS 6 to Windows 3....no 2.0.....l" Nope: i still remember my boss being enthusiastic about Windows 1.0, later 2.0, then 3.0, then 3.1 ... i started using Windows with version 3.1. Win 1.01 was introduced in 83 but didnt get out til 85, Win/286/386 in 87 (had a 2 3/4 year run) Win 3.06 in 90 and then 3.1 in 92...then went on Win 95, Win 98 etc...Can never figure out why they are not just normal numbers without all the decimal work, even to this day. OMGAWD I'm getting old if I can remember those! Sammy, Actually it was Windows 1.01 then Windows/286 and a few months later Windows/386 (Windows 2.02, 2.03) then Windows 3.06 then Win 3.1 Win 1.01 was introduced in 83 but didnt get out til 85, Win/286/386 in 87 (had a 2 3/4 year run) Win 3.06 in 90 and then 3.1 in 92...then went on Win 95, Win 98 etc...Can never figure out why they are not just normal numbers without all the decimal work, even to this day. OMGAWD I'm getting old if I can remember those! DJ, Just to add, if you go to the site to get the Windows version. it's 1.2.0.11....again with all the dang decimals, and it's an older version than here. HellsBells, Ha, ha! Whatever .... I'm old and senile what's your excuse? Some people trying to bring back the Amiga. There are retro systems, raspberry pi emulated versions and even new systems. DJ, I didn't know they had an update in 2016, but yah I read an article about the update at the end of 2018. =D Some people trying to bring back the Amiga. There are retro systems, raspberry pi emulated versions and even new systems. Joke, Yes, at the bottom of the archive with a lot of dust on it. On 5¼ floppy, 180Kb? Joke, I have DOS 6.22 on one computer, with windows 3.11 inside it. Also as an alternative boot (via system commander) I have Windows 98. The other computer has windows XP and an internet connection. They are not connected so that the DOS one is not connected to the internet and does not get a virus. Data is transferred by a floppy (from Dos) or by USB between windows. The main advantage of DOS is WordPerfect 5.1, that of Windows 3.11 is Paintbrush, a nice simple graphics which does not work on XP. ("Paint" is useless.) Win 98 is just still there, no need to remove it. Sometimes I use it for WP instead of pure dos. The arrangement is highly satisfactory. I intend to keep well away from any later Windows. Joke, I have DOS 6.22 on one computer, with windows 3.11 inside it. Also as an alternative boot (via system commander) I have Windows 98. The other computer has windows XP and an internet connection. They are not connected so that the DOS one is not connected to the internet and does not get a virus. Data is transferred by a floppy (from Dos) or by USB between windows. The main advantage of DOS is WordPerfect 5.1, that of Windows 3.11 is Paintbrush, a nice simple graphics which does not work on XP. ("Paint" is useless.) Win 98 is just still there, no need to remove it. Sometimes I use it for WP instead of pure dos. The arrangement is highly satisfactory. I intend to keep well away from any later Windows. Zen , That's cool you still have all that old software. I have Dos 6.22 with original box. I have original Central Point Desktop floppies. I have lots of old software I kept around in boxes. I was thinking one day I might get a raspberry pi with all the emulated environments, from old dos, windows, Atari, Amiga, mac, etc. for fun. I still have some of the software from the different systems I have owned in the past. I now regret selling the systems with much software back in the day, but I needed the money to buy the new systems. As a developer, I was asked to beta test Windows 1.0 before it came out. I wasn't very impressed, but that was because there wasn't any 3rd party software to use with it yet. The demo was typically showing how you could have 15 copies of the clock program running, each in its own window. I think 1.0 was around 15 floppies (5.25 but I don't recall if they were 180 or 360 by then). I still have them all packed away in storage, and the files backed up in case the magnetic material were to fail (although pointless in a way because I don't intend on installing it ever). I also have Windows 2.0 and every Windows since. I also have every DOS version, and several CP/M versions, plus all my OS/2 versions. For me, the best DOS was 2.0 because it added directories and piping commands. Ah, finally, it was getting similar to UNIX; but MS being concerned about infringement decided to use the backward slash to separate directories, and a forward slash to indicate DOS command options. Phil Katz was so incensed by this that his PKZip internal files used forward slashes in filenames. I also have several variants of older UNIX (including Xenix), plus early GUI front ends for UNIX (some never installed). I also have an original IBM 5150 4.77 MHz 8088 computer that handles my midi and Korg keyboard just fine, Osborne 1 (bought used for $5), and a Compaq fold-up. I also have some super-mini computers that were way faster than PCs at the time, now ancient in comparison. The last time I had the chance to check, they all booted up. I have a lot of software on 9 track tape reels, and even though I have a tape drive, I don't have the guts to see what would happen. The hardware is housed in a temperature controlled environment to protect them for as long as I can, but I have a 10x10x10 separate building packed full with lots of PC cards, all sorts of software, a lot of it purchased, many I wrote myself, plus a collection of old PC Magazine ads I ran. I know that I am not the only one that has retained lots of old software. So yea, there are some folks out there that have Windows 2.0, and I (like so many others) instantly read the title of this GOTD offering as if it was for an old version of Windows. We will let it slide, because it was a good joke and a good reminder of what where we have have been. Joke, As a developer, I was asked to beta test Windows 1.0 before it came out. I wasn't very impressed, but that was because there wasn't any 3rd party software to use with it yet. The demo was typically showing how you could have 15 copies of the clock program running, each in its own window. I think 1.0 was around 15 floppies (5.25 but I don't recall if they were 180 or 360 by then). I still have them all packed away in storage, and the files backed up in case the magnetic material were to fail (although pointless in a way because I don't intend on installing it ever). I also have Windows 2.0 and every Windows since. I also have every DOS version, and several CP/M versions, plus all my OS/2 versions. For me, the best DOS was 2.0 because it added directories and piping commands. Ah, finally, it was getting similar to UNIX; but MS being concerned about infringement decided to use the backward slash to separate directories, and a forward slash to indicate DOS command options. Phil Katz was so incensed by this that his PKZip internal files used forward slashes in filenames. I also have several variants of older UNIX (including Xenix), plus early GUI front ends for UNIX (some never installed). I also have an original IBM 5150 4.77 MHz 8088 computer that handles my midi and Korg keyboard just fine, Osborne 1 (bought used for $5), and a Compaq fold-up. I also have some super-mini computers that were way faster than PCs at the time, now ancient in comparison. The last time I had the chance to check, they all booted up. I have a lot of software on 9 track tape reels, and even though I have a tape drive, I don't have the guts to see what would happen. The hardware is housed in a temperature controlled environment to protect them for as long as I can, but I have a 10x10x10 separate building packed full with lots of PC cards, all sorts of software, a lot of it purchased, many I wrote myself, plus a collection of old PC Magazine ads I ran. I know that I am not the only one that has retained lots of old software. So yea, there are some folks out there that have Windows 2.0, and I (like so many others) instantly read the title of this GOTD offering as if it was for an old version of Windows. We will let it slide, because it was a good joke and a good reminder of what where we have have been. Louis Crypot, I have been looking for (and at) dozens of "We will convert anything" programs for several years now, looking for something to convert M4A to MP3, and none of them have actually been able to do it. To save time on my part, I think this was a reasonable question,deserving of a non-rude reply. That being said, in the absence of any useful reply, I have installed the software and it DOES in fact accomplish the transformation (although only at at 256 bit rate- 320 would have been better, but 256 is perfectly acceptable to me). It IS unfortunate that it requires I-Tunes to work (why else would I be wanting to convert M4A's to MP3's), and it keeps wanting me to upgrade my outdated and unwanted I-Tunes, which I will keep declining - but it works adequately for what I want/need. Lastly, I would like to suggest a bit of politeness on the part of your replies. Thank you.